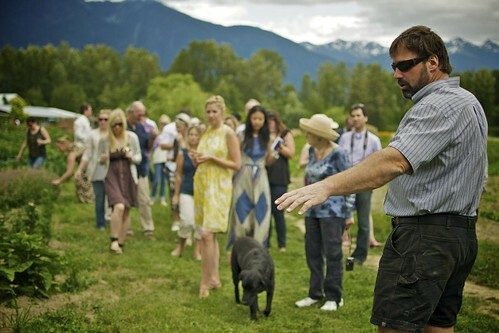 Araxi Restaurant, a star of Whistler’s restaurant scene, is hosting the Araxi Longtable series at North Arm Farm in Pemberton August 27 and September 11, 2011. 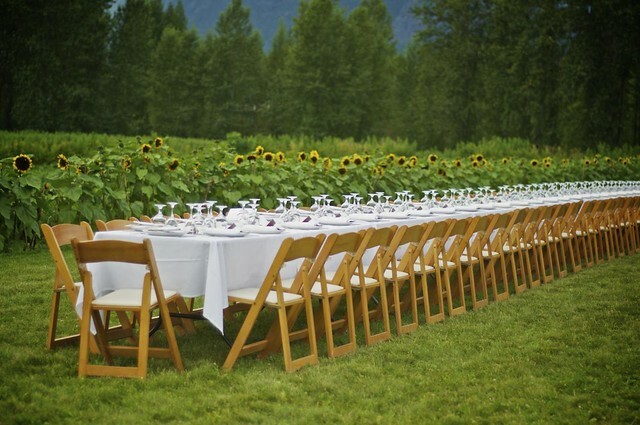 A “longtable” meal is exactly what it sounds like – a meal served to a large group at a long table – but this this series will also see that table sitting in the middle of a field at North Arm Farm (driving home the point of “farm to table” cooking). 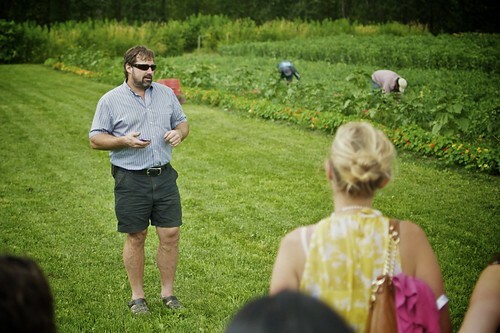 The afternoon will start with a tour of the family-run North Arm Farm with proprietor Jordan Sturdy. 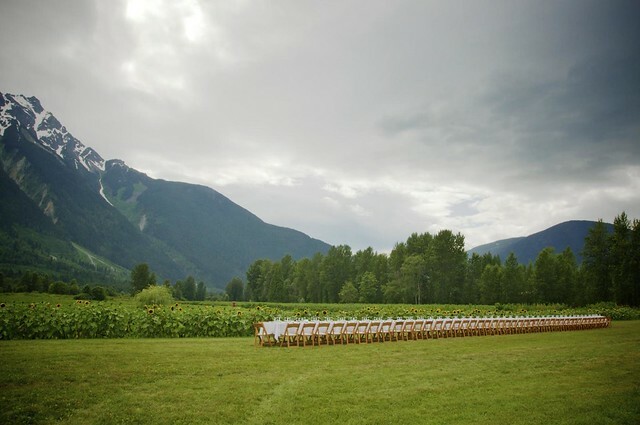 Then, Chef James Walt (of Araxi) will use dozens of ingredients sourced from the farm and the Pemberton Valley in order to prepare a 4-course menu. Beef from the pastures of Pemberton Meadows, daily-catches from the coastal fishery, BC’s best wines, and more. John and I enjoy Araxi so much that I created a tag for it on my site (where you can see all of my posts about Araxi at once). 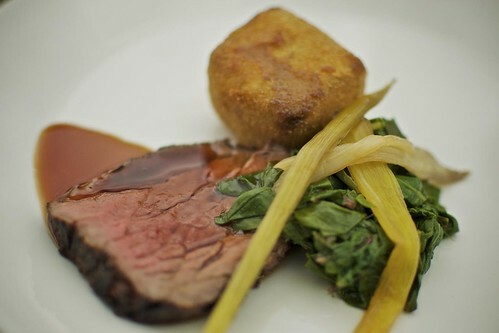 Chef James Walt’s creations are always fresh, locally-sourced, and bursting with flavour. We attended the Araxi Longtable on July 30th and once again had an amazing experience. Over 90 people were at our table, many couples from Whistler and Pemberton and a few visitors hailing from California and even Ohio. Everything is served family-style so you get to know your neighbours and wines are constantly being refilled and refreshed. 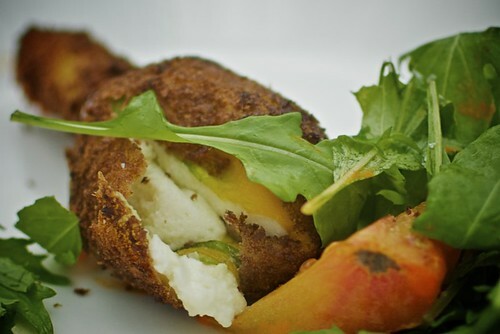 Stuffed with Okanagan goat cheese, with heirloom tomatoes, Root Down organic greens, red pepper vinaigrette. With roasted North Arm beets, English pea and green tomato salsa. 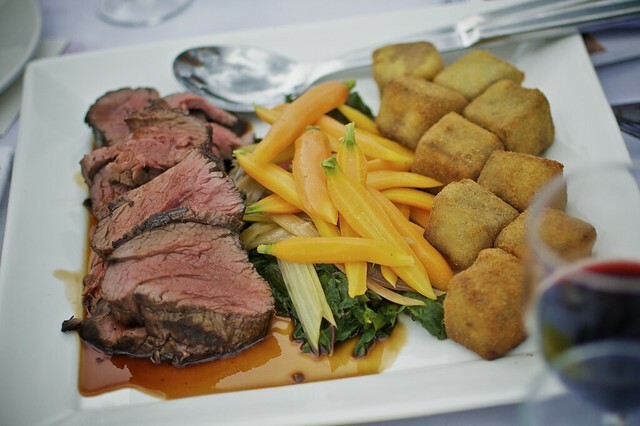 Crispy beef cheek fritter, pepper and rosemary roasted sirloin with North Arm rainbow chard and baby carrots. 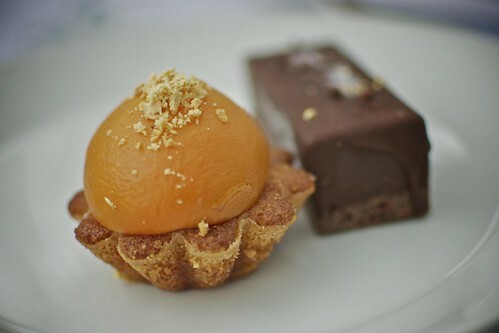 Strawberry ice cream dipped in dark chocolate and Agassiz hazelnut financier with Okanagan apricots. The wine pairings were spot-on but we enjoyed the Quatrain the best (very smooth). The zucchini flowers are something I could eat every day (crunchy and fresh yet creamy on the inside), the salmon was deliciously smoked, and I have to say the beef cheek fritter was a real surprise. Crunchy on the outside and the slow-cooked pieces of shredded meat on the inside were tender and moist. Chef Walt knows how to combine textures and flavours into the most interesting and unique packages on your plate. 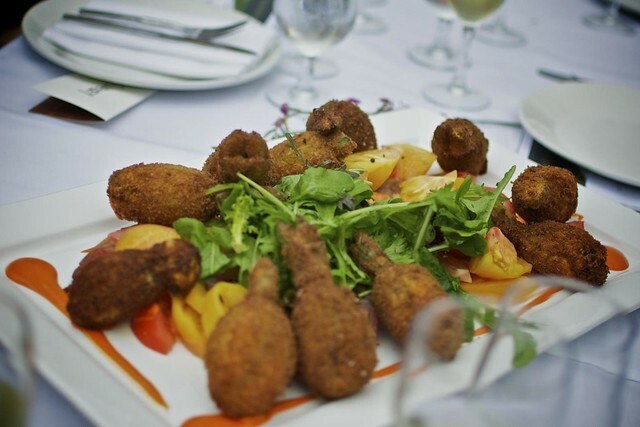 This spectacular meal is enjoyed outdoors and tickets are $160 all-inclusive (4-course menu, wine, tax, gratuity). Return executive transportation from Whistler Village is available for $35 per person, including tax. If you would like to attend and to experience stunning scenery and farm-fresh ingredients, here’s how you can enter to win two tickets from me (valued at $320) for the either August 27th or September 11th (winner’s choice). 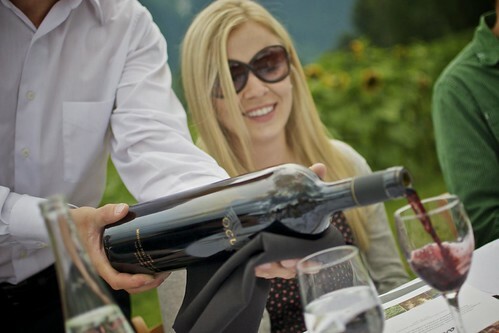 Each evening will have a different featured winery for pairings. I will draw one winner at random from all entries at 9:00am Wednesady, August 17, 2011. Must be 19 years of age or older to enter and win. Please enjoy responsibly and plan a safe ride home. Return executive transportation from Whistler Village is available for $35 per person, including tax. All photos in this post were taken for Miss604.com by John Bollwitt. You can view more photos from our evening at North Arm Farm in his Flickr set. Update The winner is Helen! Disclosure: As with all of my contests and posts, I was not paid to write this or offer this giveaway. However, our experience was compliments of Araxi. Favourite local ingredient would have to be spot prawns. Fresh-grilled, with just about anything on top! Local swiss chard is the best! Favourite local ingredient would have to be spot prawns (grilled, with just about anything on top!) when it’s the season, but Rossdown Farms chicken and Sloping Hill meats aren’t far behind! Oh wow, I love that Araxi sources all their food locally, I would very much like to go to this. I love cooking with Richmond berries! We just picked zucchini from our garden, so delicious! Wow! The scenery looks amazing and and the meal looks delicious! I would love to go! I love local strawberries, one of my favourite ingredients to use in summer salads and desserts 🙂 This event would be spectacular! My favorite local ingredient is kale that has been coming in from Aldergrove that is being sold at Whole Foods. So fresh and tender and has been delicious in my smoothie. Blackberries!!! and spot prawns. and mussels. What an amazing way to enjoy a meal. My favourite local ingredient has to be a freshly caught Salmon. I’d love to go this dinner. My favorite BC local ingredient is spot-prawns. Local organic strawberries are my favourite! I love Araxi so much! My favourite local ingredient is whatever the fresh catch is down at the granville island docks. yum fresh fish. Raspberries and Blackberries from my garden! I love Pemberton. It’s my relaxing getaway from the city. My favorite local ingredient is sockeye salmon! If you are there again, stay at the Pemberton Valley B and B/winery. It has a view of Mount Currie that you could stare at for hours. I would love to go back for this long table! My favourite local ingredient changes depending on season. Spring is spot prawns, summer is strawberries, fall is apples and winter is potatoes. Local mushrooms are great, especially morels and chanterelles. Local seafood is just fantastic, but my favourite is sockeye salmon! When spot prawns are in season, they are the best local/sustainable ingredient! Love them! spot prawn season is my FAVORITE. juicy, fresh and succulent. Heirloom tomatoes. On toasted sourdough with mayo and a touch of salt. Does wine count as an ingredient?! For summer, I love love love fresh blueberries – shake ’em or bake ’em 🙂 Thanks for this opportunity– Araxi is positively my fave restaurant — I’ve had heaven in a meal there many times before and the long table experience just seems lovely. the delicious green beans from my own garden! My favourite ingredient is a splash of BC wine! I love putting a little bit of white or red wine in my dishes as a final touch. A glass in hand is also a must when cooking. One of my new favourite is Road 13 Old Vines Chenin Blanc. Mmmm! My FAVOURITE local ingredient is blueberries; I’ve been putting them on everything! Your photos are amazing. 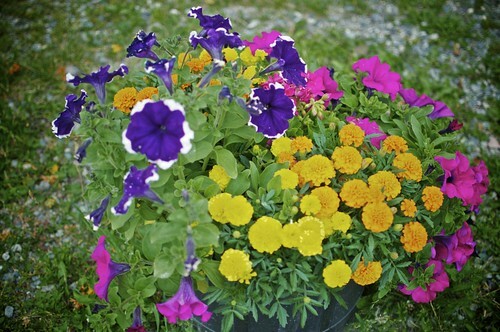 The colours of everything is so vivid. Yes please! Would love to attend this! Mmmmm…local spot prawns…. That looks so so so fun (and tasty!) I love popping by the Vancouver Farmers’ Markets on Wednesday at Main St Station. Right now, I get pounds of blueberries to freeze! Local blueberries. Had a wonderful dinner at Araxi’s 2 weeks ago. 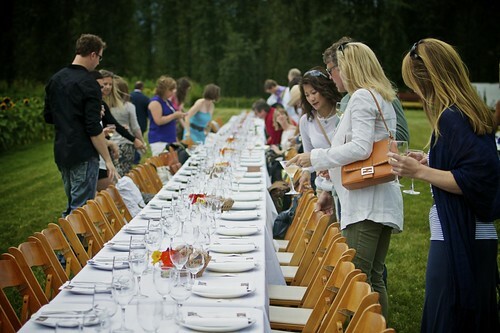 Attending a longtable dinner would be a fantastic way to end the summer. I love baking with gooseberries! spectacular pictures! my favorite local ingredient: corn! 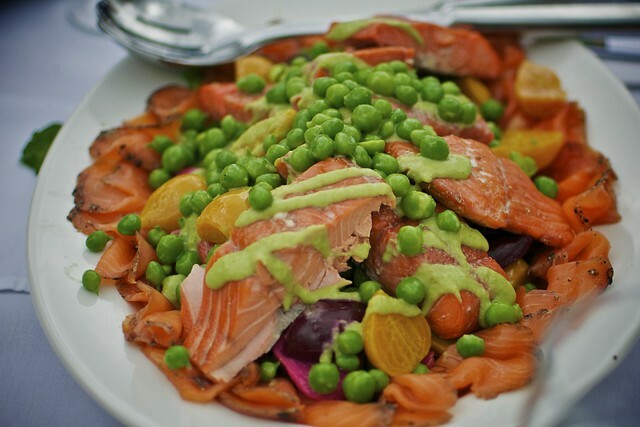 Wild Coho salmon are probably the most beautiful of BC’s local, fresh ingredients. To be honest I hated salmon until I moved to BC and learned just how beautiful it can be, especially raw! Looks like fun, yes please! My favourite local ingredient has to be the lettuce grown in my own garden! looks delicious, would love to go. Love sockeye salmon and beets! Mmm local squash is so good! I would absolutely love to attend!! The salmon looks amazing, if I don’t get to go I’ll have to make some myself. 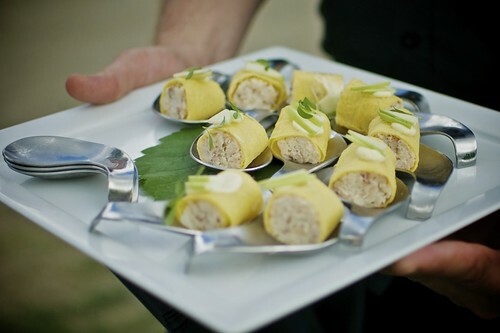 Gotta agree again with the salmon..
Would love, love, LOVE to experience the Araxi Longtable! It looks amazing. I love our local berries, especially the blueberries. I love our salmon! And Cherry Wood Hot Smoked Barclay Sound Sockeye Salmon sounds awwwwwesome! Fruit!! What a great idea, I love Araxi. Local blueberries right now are spectacular! This looks amazing! My favourite local ingredients are Oakanagan peaches! My secret baking ingredient? Toffee bits. Makes everything better! Shoot. Wrote w/o reading the instructions properly. Let’s try this again. My favourite LOCAL ingredient is delicious and juicy blueberries and strawberries. Especially when I can pick them straight from my friends’ backyards! Favourite local ingredient is any type of berry. I am addicted to fruit and love using berries wherever I can. The thought of this dinner makes my mouth water. In my last delivery I ordered a cream cheese from pane e formaggio which is to die for…mmmm! Working at Rain Grill last summer I was fortunate to serve so many local organic dishes, one of my favorites was the array of fresh tomatoes served with balsamic, fresh basil and fresh organic boccacini yum..miss it. So hard to choose, but it would have to be heirloom tomatoes. Yummy! My favourite local (really local) ingredients are the tomatoes from my summer garden! Yum! Tomatoes for sure! Absolutely delicious. Oh man, what a great prize. I am very envious of those people in the pictures. My favourite ingredient to cook with at this time of year are the Blueberries. Anita’s Organic Flour. It’s local and organic and it makes great pie crusts and breads. This looks super delicious! I’ve been enjoying way too many local blueberries that I’m surprised I haven’t turned into Violet Beauregarde from Charlie and the Chocolate Factory. Amazing! That table is almost as long as some of my family dinners. I would love to be a guest, rather than a hostess at this longtable. Looks like an amazing experience! One favourite ingredient of mine? Mushrooms! Blackberries. Now if only their season could be extended. I love the Okanagan cherries! Oh I’d love to treat my friend to such an amazing food event. When I moved to BC she introduced me to the dining scence and the flavours based on local ocean wise seafood. So my first thought is the local seafood. It’s her birthday and this would be a night where I could give her something back. She deserves it. Salmon!!! Oh this would be too good! Has to be the spot prawns though scallops from the island are a close second. spot prawns are the bomb! I would have to say anything from my 1st ever vegetable patch this year tastes great! I love cooking with spot prawns! I hope I win! Mmmmm…. My Favs? Spot prawns or blueberries! In southern california my favorite local ingredient for both baking and cooking has got to be FIGS! I love the local feta on everything from pizza to salads. I would love to go to this! My fav local ingredient is Morels! It’s gotta be the mighty Pemberton Potatoe!!!! My favouite local ingredient to cook with right now are huckleberries, my daughter and I have made some amazing pies with them. My favourite local ingredient is blueberries! Having lived in Australia and South East Asia, nothing, i repeat NOTHING compares to BC Salmon! Wow… this looks like an incredible experience!!! Fave local ingredient is a tie between Salmon and Blueberries… especially this time of year! oh how i would love to attend. Right now my favourite local produce is blueberries. Blueberry salsa has been a staple in my house! I always enjoy fresh Halibut from the waters off our coast. Not a huge fish fan, but agree that Sable fish is amazing. Mmm. This is drool-worthy. Favorite local ingredient has to be beets… roasted, pickled, slaw, any way at all! By far, favourite local ingredient of the moment is Swiss Chard. I go through a bunch every second night, thus many trips to the farmer’s market. Fresh raspberries in the summer and then the homemade jam all year round.. delicious! organic beets straight from my mom’s community garden plot at Crescent Beach..i love beets! North Arm farms is one of my favorite places! I have drooled over the pictures and descriptions of the long table meals there for the past 2 years. I am headed up there this weekend to pick strawberries. I would have to say my hands down favorite BC fresh ingredients are Golden Beets & Fingerling Potatoes (a close second), both are amazing in a fresh Nicoise salad. The berries are a must-have from my Farmers Market adventures, and I’m loving the locally raised pork available too! My favorite local ingredient would have to be blueberries! Favourite has got to be SALMON! it would be rainbow trout. yum! A-MAZE-ING experience, please pick me!! Biodynamic apples. Totally worth the hype, thinly sliced over puff pastry with a light glaze of maple syrup. Or freshly foraged boletus mushrooms, with thyme and thingly sliced garlic, a touch of chicken stock and some good olive oil, over Mikuni’s aged arborio risotto. This would be amazing. Looks delicious. Favourite local ingredient would be Sockeye Salmon. Can be sushimi or grilled. my fave local ingredient is raspberries and blackberries! Going to pick them myself makes it even more rewarding. So delish in smoothies and pies/tarts! Strawberries are my fav local ingredient, what a beautiful setting! Salmon is my fav local! Wow the food looks amazing. This looks like a beautiful event and I’d love to attend! Blackberries! Though they are a little late this year. Nom nom nom. Yummy! My local favourite is sweet chilliwack corn! Favourite local ingredients are BC blueberries and sweet Chilliwack corn. Mmmmmm. Locally caught BC sockeye. Bliss. But nothing wrong with some sweet BC blueberries – used to work on a blueberry farm for several summers and I never got tired of them! This looks like a spectacular experience. It would be amazing to attend! I love local blueberries! I just bought a 10lb box (which I didn’t realize is so huge) and have made probably eight different things with them both savory and sweet! Yum! These days, the strawberries and mint have been beautiful and bountiful. Obviously unoriginal but I’m loving blueberries right now! Definitely salmon. 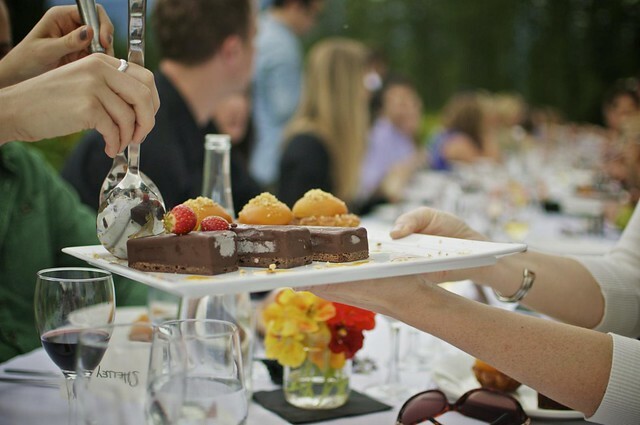 When I organized a long table dinner focused on local ingredients it was the focus. Salmon and local blueberries. TD4. Definitely all the BC berries. This would be a memorable dinner. Okanagan peaches for a summer french toast breakfast. My favourite local ingredient is berries, any berry will do! I would lovvve to attend local blueberries and spot prawns fav. Local berries for breakfast – or any type of seafood from our local BC waters!!! Figs from my garden in Vancouver. Nothing beats local potatoes for me! So much yum! I can’t get enough of the Chilliwack corn – its so sweet and I haven’t been able to find any other corn that tastes so good. Love those fresh local berries and corn when its in season! Wow…what a great prize! Love a fresh local chicken and veggies on the BBQ! Local berries and fresh produce. fresh local blueberries for muffins on a sunny sunday morning! Morels – sauteed with a little sherry and fresh thyme on toasted brioche. Sublime! i like to use bc wines for cooking. often i use white wine, sometimes also red wine. sooooooooooooo hard to think of just one!! Dungeness crab, salt spring island lamb, spotted prawns, chilliwack corn, langley raspberries, lulu island blueberries, pemberton potatoes ohhhhhhh mmyyyyyyyyyyyyyyyyy!!! What a great event this is! thai basil from my garden! Me and my cousin would love to go. potatoes, berries and chilliwack corn!!! Local swiss chard. my wife uses it in her philipino soups…so good. Favorite local ingredient is definitely BC Spot Prawns!! Amazing with pretty much any local produce you can imagine. My favorite local ingredient Qualicum cheese, in my mind you can’t be a fabulous cheese plate! Local BC blackberries, straight off the bush! Local blueberries can’t be beat – they are good with cereal, yogurt, in muffins, in a green salad, in a sauce over various meats, and on top of ice cream. I also like spot prawns. Must try blueberries with spot prawns some time. BC Salmon! We are so spoiled because our seafood is so fresh! My faivorite local cooking ingredient are red peppers from pembertonia. Those red peppers graced my table this evening as quinoa stuffed peppers, delish! Fresh, local cucumbers are the best – especially long english cucucmbers! My favourite local ingredient is fresh greens picked fresh from my garden plot – so delish! Sockeye salmon is the best. We have an amazing selection of local fresh ingredients for cooking, I don’t think I can pick a favourite. I do however love our blueberries and salmon. You can’t beat our local salmon! I would LOVE tickets!! My favourite local ingredient is the Urban Grains CSA triticale flour! I LOVE berry picking in pemby! Local blueberries are the best. What an amazing event this would be! I love BC’s sweet corn. Fresh dark BC cherries, organic of course… oh my mouth waters at the thought of the many tasty things one could do with a bowl-full! Local cherry tomatoes…roasted in the oven! Fresh herbs from my garden would have to be my favourite! It’s been said before, but I’d have to repeat – spot prawns!! Soo delicious when in season. Would love to go. I like to use wild fennel to make a great braised arctic char. Yummy. Love the concept and would love the opportunity to partake! Gotta go with the Spot Prawns! Although I’m excited to taste the masterfully prepared bounty of local ingredients, my favorite ingredient is my lovely wife sitting beside me. We have traveled the world together hand in hand for nearly 20 years. She found this event and suggested it as a great way to celebrate my 50th birthday. We’re headed there from Springfield, Missouri in September. I hope you will introduce yourself if you attend. Heirloom tomatoes are great and my fave! Chilliwack Peaches and Cream Corn on the Cob. Mmmmmmmmmmmm!!!! BC hot house bell peppers all the way! Boiled, baked, mashed, chipped…even distilled into vodka! 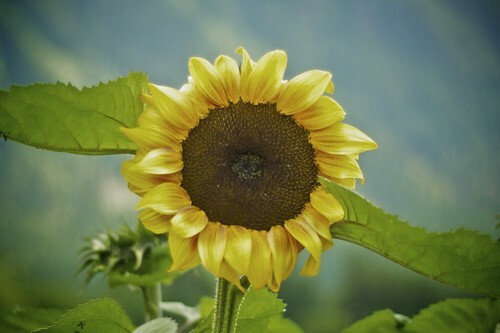 You can’t go wrong with such a versatile little golden nugget! Right now it is all about the fresh blueberries! Fave recipe: rinse by the handful and roll into your mouth. Too many local favorites to choose from but Little Qualicum Cheeseworks is fantastic! Add some wine from the Okanagan and you’re set! At this time of year I love cooking with blueberries – sauces, salads, deserts, shakes – and so much more. My favourite local ingredients are North Arm beets, patty pans and potatoes, of course! Green figs from my back yard! Since Pemberton is famous for its potatoes, you have to try them. Combine various coloured nuggets and fingerlings with blueberries, locally grown green beans, kosher salt, olive oil, fresh dill,pressed garlic and you have a potato salad to die for. My favourite local ingredient is hazelnuts, they are significantly different when one grows them than when bought at the supermarket, oh, ya!